Wed., Feb. 6, 2019, 6:49 a.m. While John is on a three-week ski adventure through Colorado and New Mexico, I'm back in Seattle for a hot minute, catching up with friends and working on a couple of assignments. 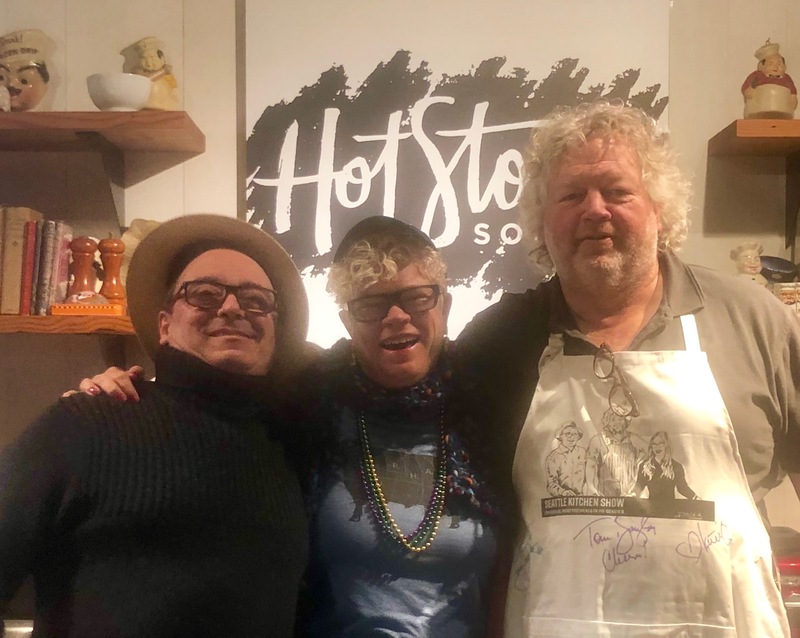 I had the pleasure of taping an episode of Seattle Kitchen, the long-running radio show hosted by celebrity chefs Thierry Rautureau -- aka Chef in the Hat -- and Tom Douglas. We talked about some highlights of the trip so far, including delicious discoveries made along the way. I brought a batch of New Mexican green chili dip, which was served to the studio audience. Of course, Tom teased me that it needed way more green chili. But then, he prompted ate the entire serving. Chewing over some of the details of our grand tour was a wonderful reminder of how grateful we are to have this amazing opportunity. Our lively conversation reaffirmed my personal mission to scour supermarkets and and eateries around the U.S., as a way to celebrate the regional culinary traditions that make travel so interesting. For instance, I had never tried green chili dip or chicos or "Christmas" enchiladas (with red AND green sauce) before falling in love with them on our tasty swing through New Mexico. Mix the ingredients together and serve with tortilla chips, or on top of a baked potato.